This is the first of a 2 part newsletter on the Melbourne Marathon Running Festival 2017. Part 2, the half marathon report, will be this Friday, October 20. It is going to be such an awesome night of awards and fun. Melanie and the team have gone to a lot of trouble to organise the night. Race day was an early start, I had planned to wake at 4am for breakfast, however I woke up at 2am , went to the toilet and didn’t really get back to sleep after that, so spent much of the next 90 minutes or so thinking about my race plan and trying to relax. I eventually went downstairs and had breaky close to 4am. I had a couple of crumpets with honey and a black tea, then back up stairs for a shower before some foam rolling and stretching before we all got picked up by our Uber driver at 5:20. We got dropped off just down from Flinders Street station and saw lots of people on their way to the MCG for the race, as well as lots of people in varying conditions on their way home from a big night out. We got to the start area just after 6 which gave me heaps of time for a warm up. I jogged for about 10 minutes real easy to loosen up a bit, changed into my race shoes and jumped onto the start area. With about 20 minutes to go I had a gel and felt pretty good. Right on 7 we were off. Conditions were perfect, slightly cool with no wind. My focus for the first 20kms was to just settle and run relaxed. I made a conscious effort to talk to a few runners around me to keep the spirits high, and we formed a really good group. I was going around 4:00/kms give or take a couple of seconds each km and felt good. At 19kms i suddenly felt a bit light headed and panicked but thankfully the feeling passed after a few minutes, this just reinforced to me to run conservatively. Brady had told me that kms 21-32 is where you can either set the race up or stuff it up, so I tried to run as smart as possible and sat in the middle of a pack of about 8 guys, the pack had broken up around 25kms and had to work solo for most of 25-30kms. As we turned to come back up St Kilda road, we had 12kms to run and I was feeling optimistic. My pace was consistent, and I was just trying to concentrate on keeping a consistent work rate. At 35kms I took my last gel and we approached the business end of the race. I saw Brady around this time and it gave me a good boost, The course is pancake flat until this point and there were 2 grinding hills to be tackled around the Shrine, I’d stopped looking at my watch by this point and was trying to run as hard as I could with 4km to go, I felt like I was running well, I was cooked but had the adrenalin pumping knowing there wasn’t long to go. It felt amazing to come into the MCG and any fatigue I had suddenly vanished, I checked my watch and saw I was a chance to break 2:49 so put my head down and went as hard as I could to the finish and was thrilled to get home in 2:48:54 which was good enough for 80th place out of 5964. 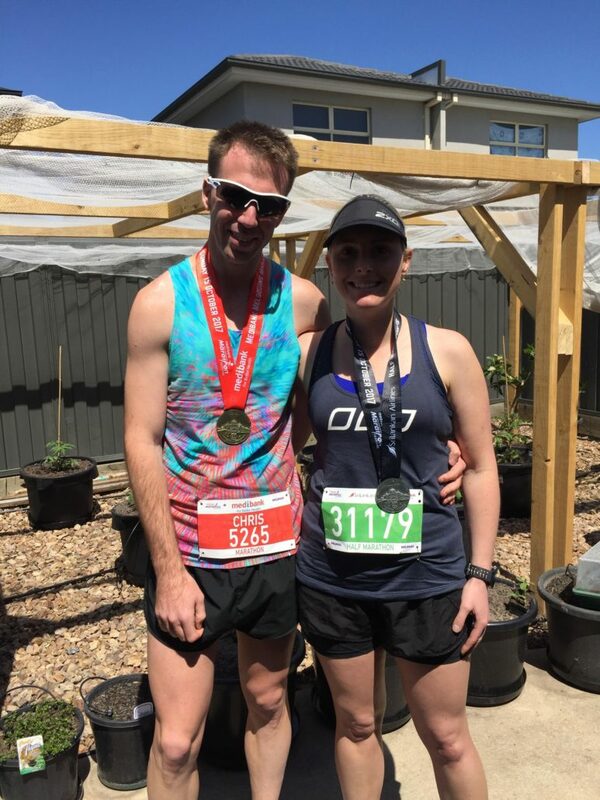 Overall I was really pleased with how everything went on the day, I ran the first half in 1:24:15 and the second half in 1:24:39, it was great catching up with Roman, Trevor, Brady and Jason after the run, and also to see Norah run a PB. It’s one of our favorite events and will be back next year for sure. I like to think that long distance running is what cricket is to footy – an off season sport for triathlon. And after weeks and weeks of training in the cold, dark and wet, race day finally arrived in glorious sunshine! 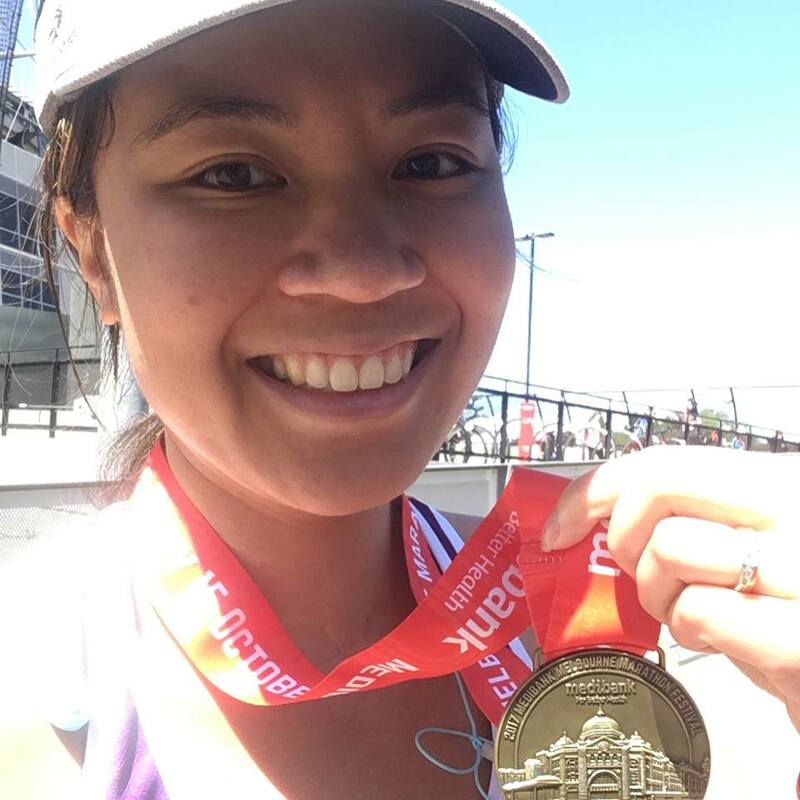 This would be my second Melb Mara; my memories of the first one was cold, cramp-y and sad ( I got rained on at 30km onwards). But you just couldn’t beat the Spring time conditions! Well I was lovin’ it. If you’re familiar with Melbourne you would know the course is mostly flat and fast. The morning greeted us with a serene sunrise over the starting line. St Kilda foreshore (17km) had only a touch of wind to move you on. My least favourite part was around The Tan at the infamous 35km mark – everyone around me was walking and moaning about it the fact it was 35km. Heck, other runners was moaning about the 35km mark when we were only 20km in! Here’s a pro tip : never walk, it’ll hurt your mental game. It was nice to relatively power through, jogging maybe but never stopping. Even at your lowest though there’s always an end and the beacon of hope came in view as the MCG. Man, it was glorious and I thank God my eyesight is good enough to see it at the 40km mark. Needless to say, a sprint finish in the ‘G was in order, and with Patrick cheering me on I felt like so very right in the moment. Every marathon is different, but the feeling of accomplishment is always amazing. I left Shepparton late Saturday morning to catch the train from Seymour to Melb. As I was just about to arrive in Seymour I realised I left my phone charger and my watch charger at home. I thought it was not a waste of money to buy a new phone charger as I could use it elsewhere. As for the watch, I would just turn it off at overnight to preserve battery. I got to Melb and purchased the charger. I headed to the MGC via tram to get my race pack. I bumped into Chris and Norah at the G. I then went to the Motel in Spencer St to check in and have a nana nap. 6pm I got some last minute supplies and something to eat. Then it was back to the motel to watch Kath and Kim and whatever else was on. 9 pm it was off to bed. I set the alarm on my phone and put it on charge overnight. Within about 10 minutes my phone started beeping every 30 seconds. I spent about ½ hour on it to try to work it out and to make it stop. I couldn’t make it stop. With my watch now turned off to conserve battery I had no devices left with an alarm. So the phone got turned off with the watch. I then rang reception and requested a wake-up call at 5:15 am Sunday. Race day – I got ready for the race with a light breakfast and headed downstairs and caught an Uber. At the start line I checked the phone and it indicated to me that the battery was low. Bloody hell, what else can go wrong. I turned it off as I intending t use the Melb Marathon app. The phone gave me nothing all race. As I crossed the start line, I started my watch. I was confused with the info from the watch as I was using a new plan on the watch. So I decided to stop the watch and start it again at the 2 km mark. I should have left it as it was or studied the plan better. The watch was right and I was wrong. Bloody technology. So that’s why my marathon on Strava is 2 km plus 40 km. This stuffed up the strategy of 5 km pace and 1 km float. But I tried to work to something similar. I felt the 10 km mark and the 20 km mark were ok and I was feeling good. When I hit the 32 km mark and I had been running for 4 hours I knew I couldn’t do another 10 km in one hour. I knew I was going to go over 5 hours in Melb for the first time. I gave it everything I had, but 7:30 min/km was the best I could manage in the last 10 km. Coming into the MCG, ACDC tried to motivate me with Thunder Struck. I don’t think it helped that much. I ran onto the G and a lump was in my throat. I didn’t know if I should cry because I ticked off Marathon No 36 or cry because it was my worst Melb Marathon time ever. Maybe I should cry because I was in pain and exhausted. Why did you take up running, Mainly for fitness, but also for the challenge.